Featuring a +1mm oversize, these Ferrea Competition PlusTM valves are some of the best available. Intake head diameter is 33.95mm, Exhaust is 31.5 mm. To manufacture the valves Ferrea uses special aerospace quality alloys, including EV8-Z18, which provides high tensile strength. An exclusive two-step slow forging process ensures proper grain flow and virtually eliminated any damage to the material structure. The valves are then heat treated and stress-relieved over a 48-hour period, which is the crucial base of the molecular integrity. These valves feature avionics-quality hard chrome along with a specially applied hard tip. The engineering staff at Ferrea spends countless hours conducting flow bench tests to achieve an optimum balance of flow, velocity and efficiency in the design of this valve. As a result, these valves incorporate smoother radiuses and unique undercuts. 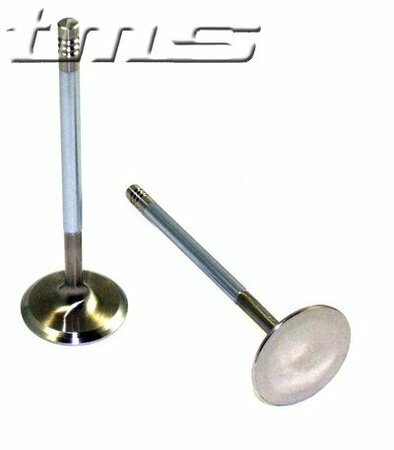 Price includes 12 intake and 12 exhaust valves.